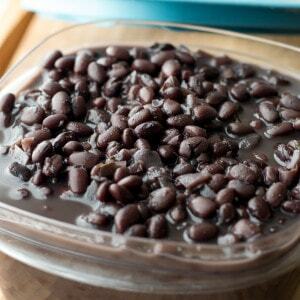 One of the most economical, simple, healthful meals you can make is a pot of richly flavored black beans. They’re the perfect weekend project — just set them out to soak on Friday evening before you go to bed, then put them on the stove to simmer while you make your Saturday morning coffee. Come mid-morning, your house will be filled with their darkly delicious aroma, and you won’t be able to resist ladling up a bowl come lunchtime. In the world of bean cookery, much has been said on the subject of whether or not a soak is necessary before cooking. I happen to think it promotes a more evenly-cooked bean, and it definitely reduces the overall cooking time. To soak beans, let them sit in their cooking pot on the counter overnight, covered by a couple inches of water. In the morning, they’ll have expanded to about twice their original size — they’re now hydrated and ready to cook. While some claim that rinsing the beans and cooking them in a pot of fresh water makes them easier to digest, I prefer to cook them in their soaking water for its added flavor and nutritional content. 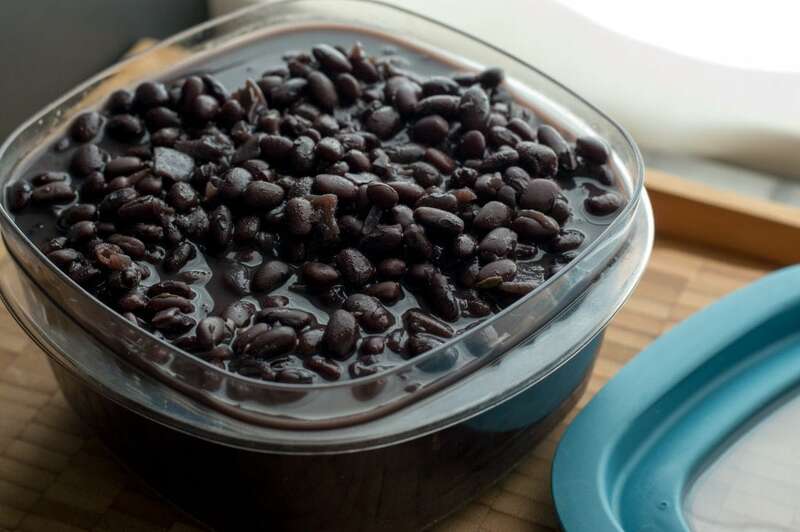 Furthermore, the soaking water contains lots of the darkly pigmented chemical compounds which give the black beans their lovely hue and add body to the cooking liquid. Toss it out, and you’ll end up with a less flavorful, faded-looking batch of beans. 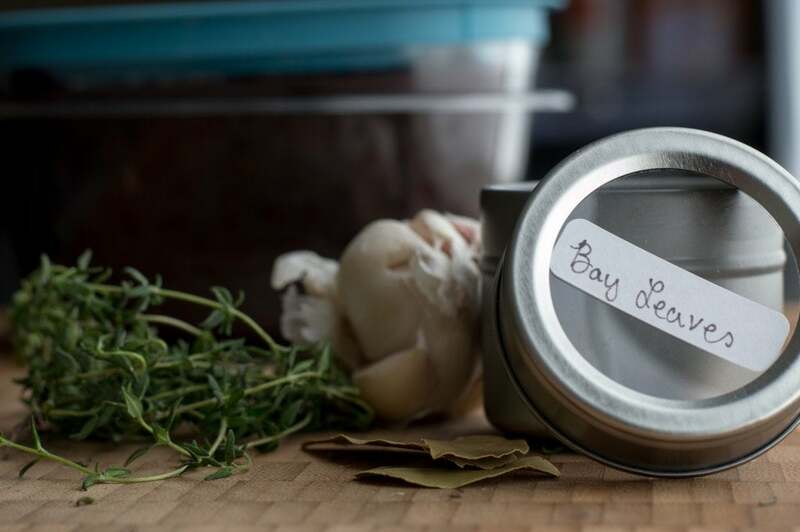 Oh, and a note on salting your beans — I tend to like mine fairly low in sodium, but if you want highly seasoned beans, consider soaking them in a brine instead of plain old water. Taking a cue from Harold McGee and America’s Test Kitchen, Emma over at The Kitchn prefers to soak hers in a brine of 8 cups of water mixed with 1 1/2 tablespoons of kosher salt. You can certainly cook your beans simply in water, especially if you plan to use them in both savory and sweet applications — some intrepid folks have even added them to brownies! I generally eat my black beans in savory dishes, so I like to flavor them with a few aromatics as they simmer in the pot. In today’s version, I’ve used chopped red onion, thyme, bay leaves, and garlic. Other good additions include carrots, celery, sweet or hot peppers . . . you can even add a ham hock or a smoked turkey leg if you like. Or, to keep things vegetarian but still add a smoky flavor, try a chipotle chili or some smoked paprika. Steve Sando of Rancho Gordo Beans recommends letting the beans come up to a hard boil for five minutes before turning them down to a simmer. I say, why not? 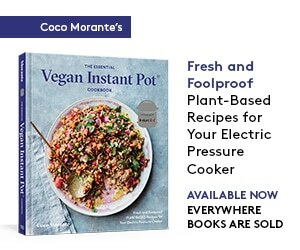 It certainly doesn’t seem to hurt anything, and probably helps to jostle a little more flavor out of your aromatics before you turn the pot down to a simmer. Once the beans are about halfway done, I like to add a spoonful of salt to the pot, then let them cook all the way through. Sando says you can tell that the beans are halfway through cooking when they smell more like beans than the vegetables you’re simmering them with. Alternately, you can taste for doneness — a halfway cooked bean will be a little too firm to the tooth, with a small ring of chalky whiteness in the center. When the beans are fully cooked, they’ll be uniform in color from the center all the way out to the skin, and their texture will be tender and soft (though not quite as soft as canned beans). 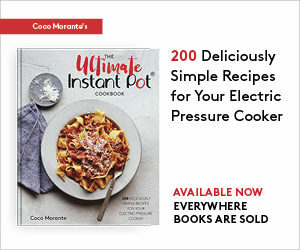 Stop cooking them before they begin to split and fall apart, removing them from the heat and allowing them to cool before storing in the refrigerator, covered with their cooking liquid. They’ll keep this way for up to a week. Serve your beans over rice for a satisfying, vegetarian meal. If you want to jazz things up a bit, you can top them with a sprinkle of cotija cheese, a drizzle of extra virgin olive oil, a few shakes of hot sauce, chopped cilantro, or some diced onions. Or all of the above. It’s up to you! Congratulations, you are now a black bean cooking expert. It’s time to whip up a batch! 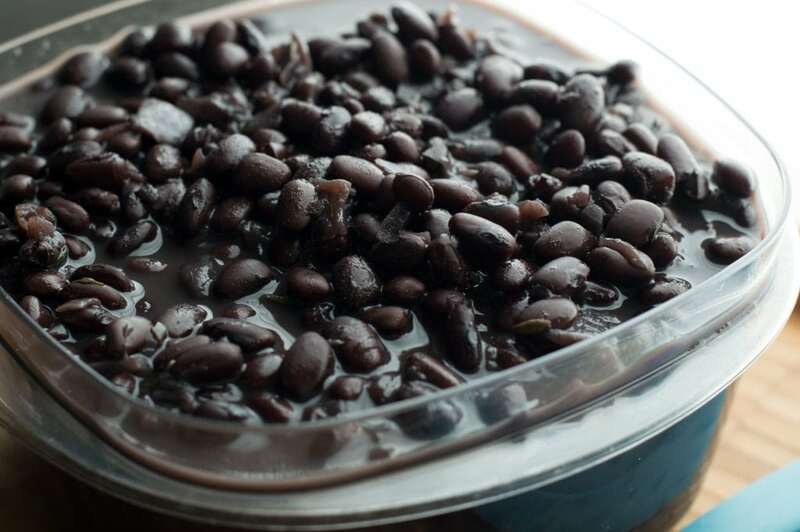 A basic pot of black beans, perfect for topping a bowl of rice, mixing into chili or adding to a batch of homemade veggie burgers. Pick through the black beans, making sure there are no twigs, stones, or shriveled beans in the mix. Give them a quick rinse in a colander, then pour the beans into a medium (5-quart) dutch oven or heavy-bottomed soup pot. Cover the beans with water by two inches, then leave to soak for 8 to 12 hours. After the beans have soaked, they will have expanded considerably. Add enough extra water to cover the now-larger beans by one inch, then add the onion, garlic, thyme, and bay leaves. Heat the dutch oven over medium-high heat until the beans come to a boil, then let boil for five minutes. Turn the heat down to low and simmer for about 45 minutes, then add the salt and continue to simmer until the beans are tender but not falling apart, about another 45 minutes. Thanks for all the good tips on cooking beans. Sounds like a perfect fall dinner! Thanks! !